« Celebrate Pro Bono Scavenger Hunt! Questions related to family law matters, such as custody, child support, divorce and visitation, are the library’s most frequently asked questions. Here is a quick rundown of available resources and referrals. If you want to learn more or can’t find what you’re looking for, please contact us! Are you looking for background and general information? If so, check out these sites. In addition, the Library carries the following print materials, which may assist you. Are you interested in the Maryland Code and Rules of Procedure? For the Maryland Code, the Family Law Article contains much of the law regarding divorce, custody, child support, etc. You can access them in print as well as online in the Law Library. If you want to access these resources from home, check out these links. Do you need to conduct case law research? The Law Library has both online and print sources to assist you. Online sources include LexisNexis and WestlawNext. Don’t know how to use these online databases? We can show you how! (If you don’t know what case law research is, check out this article – http://peoples-law.org/understanding-legal-research) If you want to conduct case law research from home, here are some options. Google Scholar is another source for finding case law: http://scholar.google.com/. For more detail about case law research on Google Scholar, check out this post. Do you want assistance with your family law matter? These organizations provide limited legal assistance. 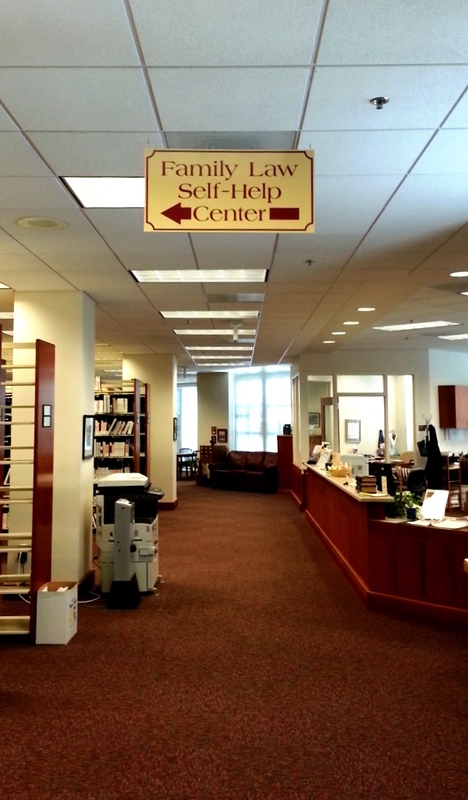 The Family Law Self-Help Center is located in the back of the Law Library; provides legal information and forms to assist unrepresented litigants in matters of divorce, custody/visitation, child support and name changes. Monday, Wednesday and Thursday: 9:00 a.m. – 4:30 p.m.
Tuesday and Friday: 9:00 a.m. – 1:00 p.m.
Monday through Friday: 9:00 a.m. – 12:00 a.m.
Family Law Hotline 1-800-845-8550 M- F 9:30 am – 4:30 pm. Family Law Forms Helpline operates at 1-800-818-9888 Tu, W & F 9:00 am – 12:30 pm, Th 9:00 am – 4:00 pm. Are you looking for attorney to represent you in your family law matter? These organizations may be able to assist you. All civil and criminal cases with no eligibility screening. Are you looking for domestic violence assistance? These organizations may be able to assist you. This entry was posted on October 27, 2015 at 7:00 am	and is filed under lawlibrary, Pro Bono, Self Represented. Tagged: 2015ProBonoWeek, access_to_justice, lawlibrary, LegalAid, legalresearch, MDcode, MDrules, probono, selfhelp. You can follow any responses to this entry through the RSS 2.0 feed. You can leave a response, or trackback from your own site.